Diane Fulkerson, Director of Library Services, University of South Florida, began with the history of OA initiatives and their common goals. 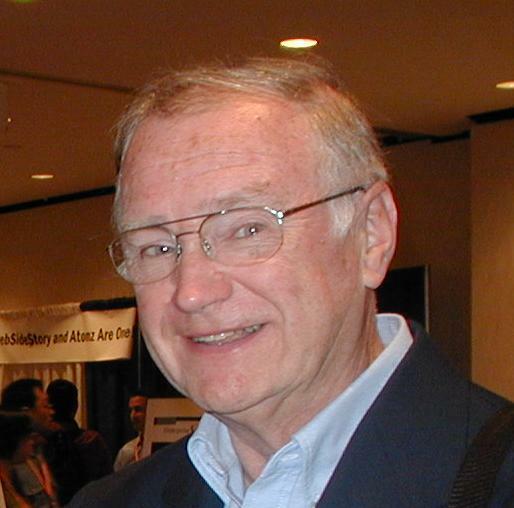 OA began with the Budapest OA initiative in 2002, and there were two others that followed in 2003. 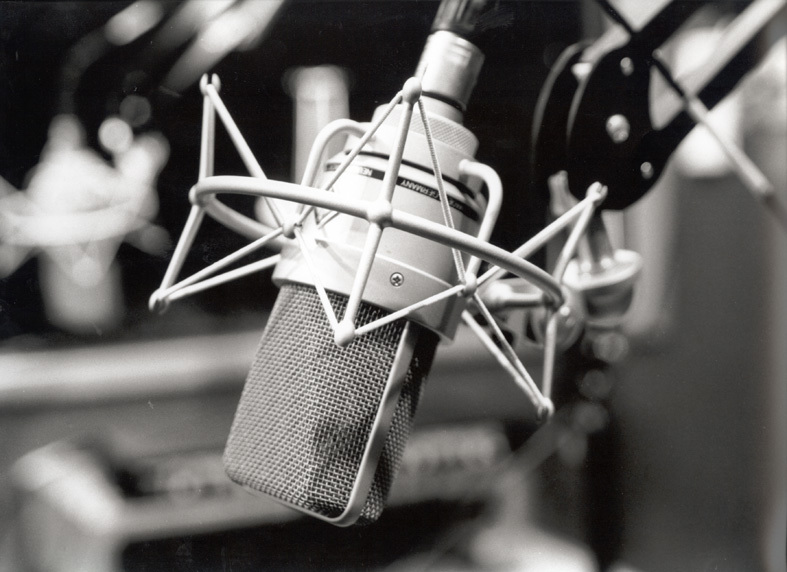 Goals of OA include removing price and copyright barriers and limiting the requirements only to attribution. We now have five types of OA, article publication charges (APCs), and predatory publishers using OA. Next steps should be support for faculty to encourage them to publish in OA journals and identifying those journals with high impact. 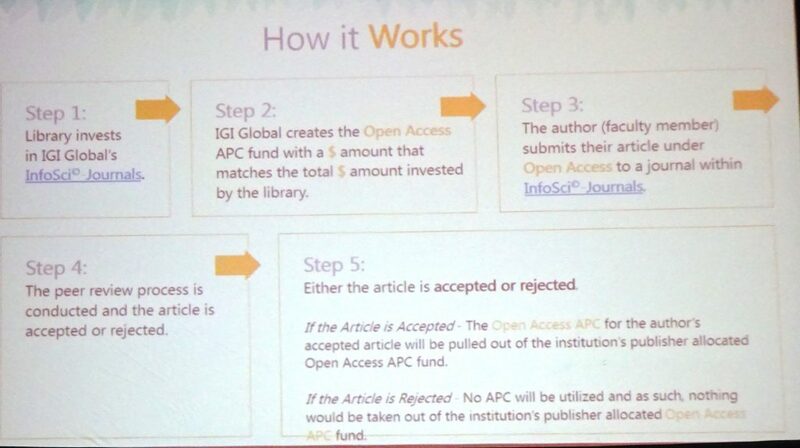 About 14.3% of OA articles are published as gold OA: they are freely available after publication; APCs can be up to $5,000. Author’s institutions do not typically fund those charges. The major downside to OA publishing is that predatory publishers are using it. 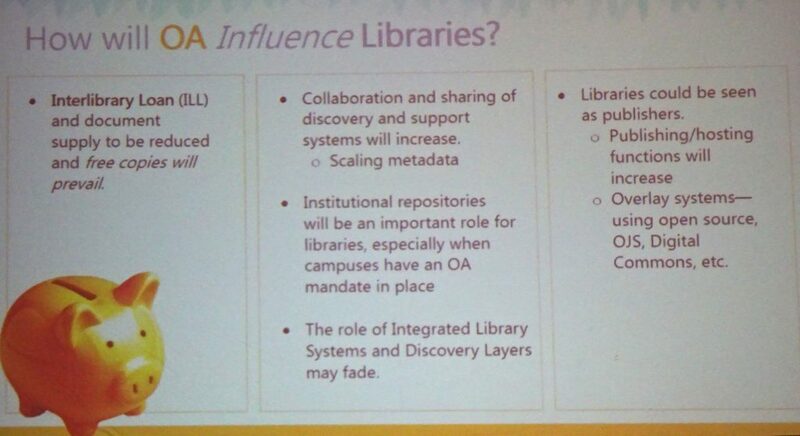 OA will influence libraries in several ways, as shown here. 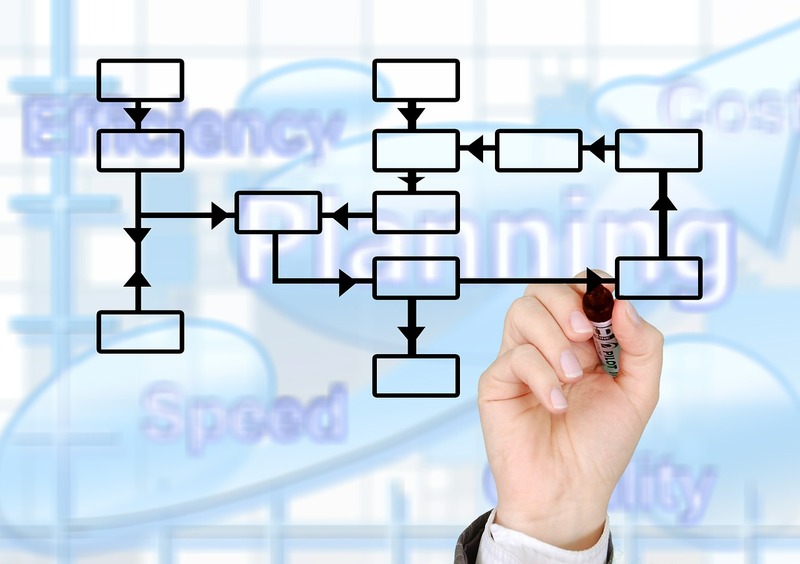 Increasing efforts are being made to share in discovery systems. 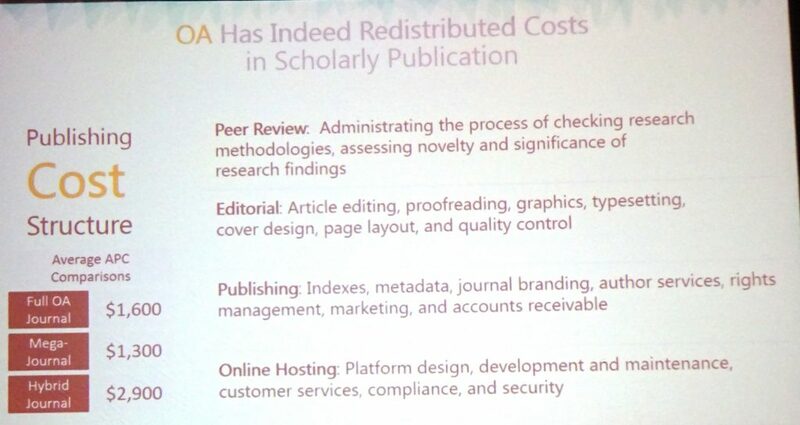 Institutional repositories (IRs) will continue to be important. Libraries are providing management and software to enable building IRs and are defining themselves as publishers. The role of funders is important. 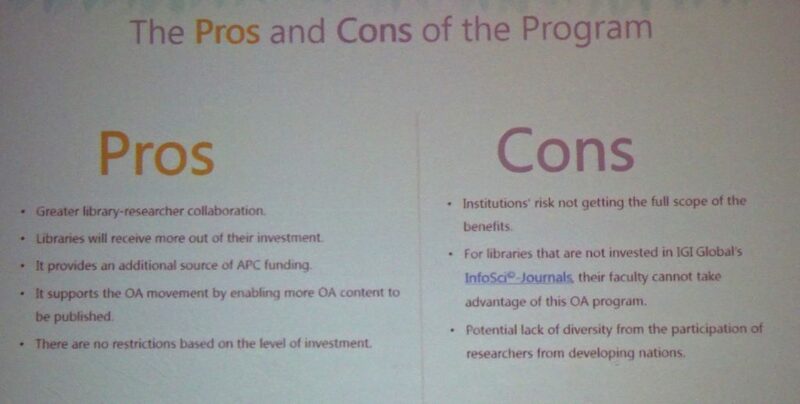 Kevin Sayer, Advisor, ProQuest, noted that books are in the early stages of OA, but there are many shifts in OA costs. Publications and brands play a significant role in OA, and a robust workflow has been established. More prestigious journals have more rigorous standards. Author recognition, financial security, and rewards are at stake. 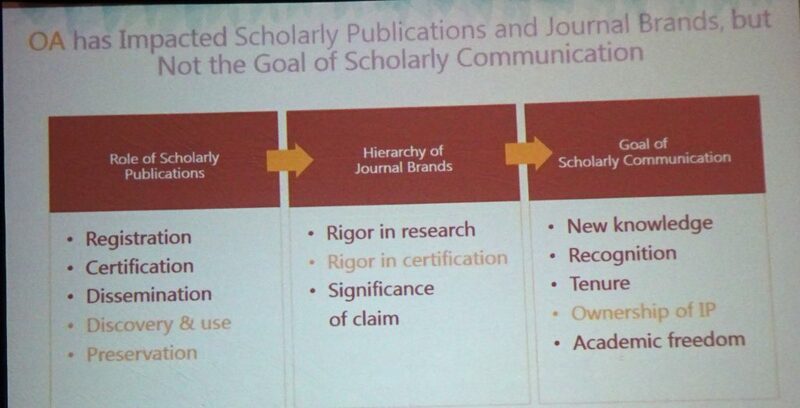 OA has impacted publications and brands, but not the goals of scholarly communication. 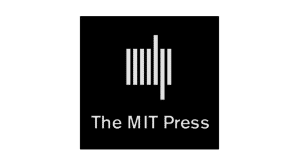 Savings in publication are offset by editorial costs so APC charges were instituted. 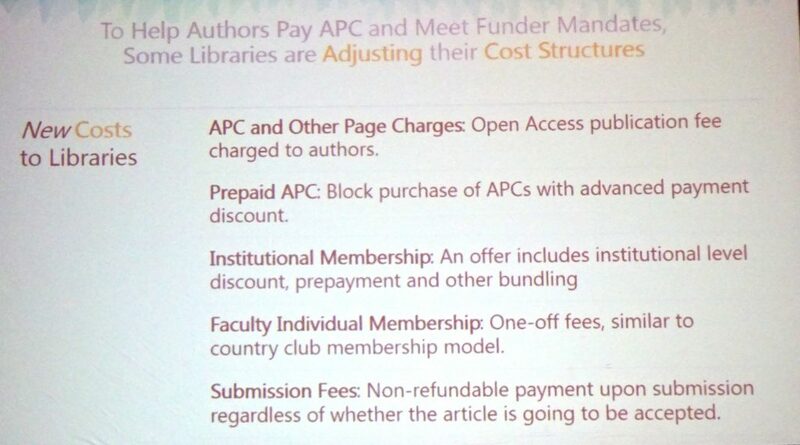 Authors seem willing to pay the fees, and libraries are starting to adjust their cost factors and services. 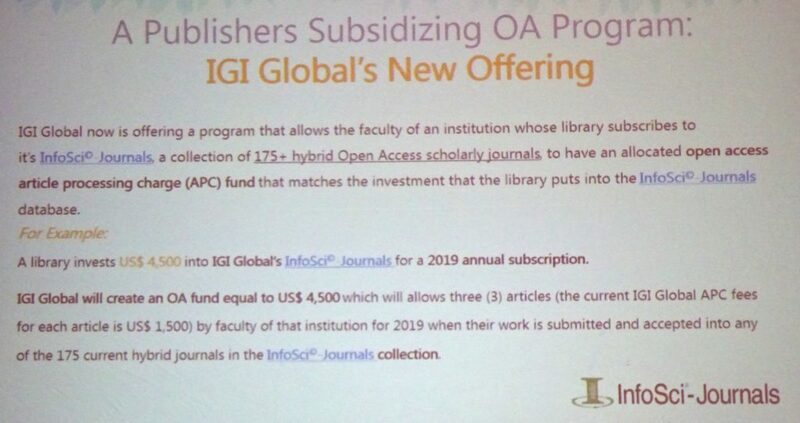 There has been a large positive response to IGI’s program.